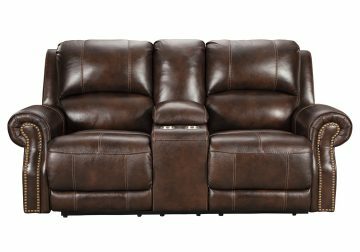 Recline in the modern luxury and convenience of the Buncrana power reclining loveseat with Easy View™ power adjustable headrest. With the touch of a button, you can easily position the recliner and its headrest for maximum comfort. Plus, with the convenient USB charging ports, electronics can be charged without having to get up. 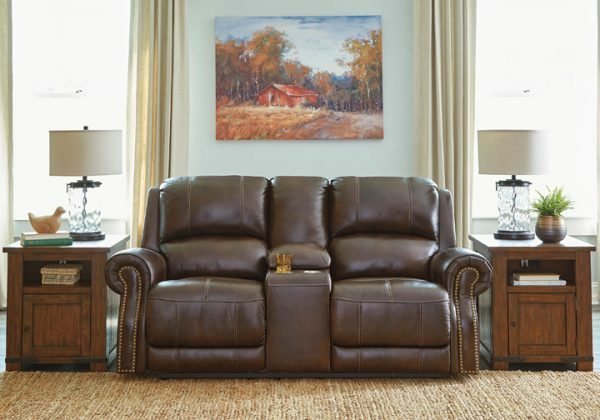 The feel of heavy weight leather surrounds you with the seat cushion, interior back cushion and armrest, while faux leather is on the back and sides for affordability. The center console tops off convenience with hidden storage under center armrest—perfect for tucking away remotes. You’ll love keeping a drink at your side with the handy stainless steel cup holder.